A new salvo has been fired in the back-and-forth debate about the existence of Planet Nine. In 2014, astronomers Scott Sheppard and Chadwick Trujillo suggested that a giant unseen "perturber" may lurk in the far outer solar system. The duo based this hypothesis on peculiarities in the orbits of the dwarf planet Sedna, the newfound object 2012 VP113 and several other bodies beyond the orbit of Neptune (trans-Neptunian objects, or TNOs). The existence of a roughly Neptune-mass Planet Nine could explain why the few known extreme trans-Neptunian objects seem to be clustered together in space. The diagram was created using WorldWide Telescope. Then, last summer, Sheppard and Trujillo found two new TNOs that Planet Nine may have tugged on, increasing the number of possibly affected bodies yet again. But a team of researchers with the Outer Solar System Origins Survey (OSSOS) project recently cast doubt on the strength of all this evidence. The apparent "clustering" seen in the TNO orbits could simply result from observational biases, the OSSOS team reported in a paper that has been accepted for publication in The Astronomical Journal. The researchers found that the objects' nodes generally aggregate at certain distances from the sun (as do those of 24 "extreme Centaurs," very distant objects with some characteristics of asteroids and others of comets). In addition, they discovered a correlation between the nodes' positions and an orbital parameter known as inclination. The new results back the Planet Nine hypothesis, said lead author Carlos de la Fuente Marcos. "Assuming that the ETNOs are dynamically similar to the comets that interact with Jupiter, we interpret these results as signs of the presence of a planet that is actively interacting with them in a range of distances from 300 to 400 AU," he told Spain's Information and Scientific News Service, which is known by its Spanish acronym, SINC. "We believe that what we are seeing here cannot be attributed to the presence of observational bias." 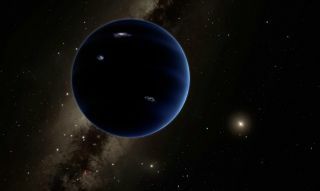 A number of research teams are scouring the outer solar system, looking for the putative Planet Nine and/or more objects that have fallen under its gravitational sway. So the new study, which was published late last month in the journal Monthly Notices of the Royal Astronomical Society: Letters, is far from the last word. Stay tuned.